Greg Norman, when asked about Oldfield. The Oldfield course offers Members year-round play on a 7,134-yard, par-72 course. Updated in 2017 in collaboration with Norman golf, the course features creative approaches, four types of grasses, new sod-walled bunkers, and expansive waste bunkers – all notable Norman hallmarks. Seriously, we do just over 12, 000 rounds a year on a Greg Norman Signature Course that’s in pristine condition…golf just doesn’t get any better. With over 60 years of experience in golf instruction, the professional staff at Oldfield will keep your game in check and make sure you’re playing to your full potential. 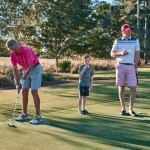 In addition to private lessons we also offer a number of clinics, golf schools, group instruction, full swing, short game and on course instruction to meet each golfer’s needs. We even have instructions for the young golfer including private lessons implementing the SNAG program (Starting New at Golf).